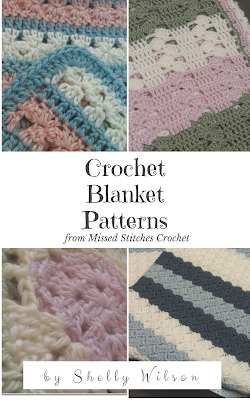 An interesting layout of basic double crochet stitches make a fun design for this crochet baby blanket. 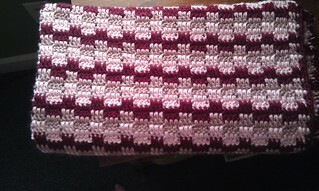 Deep maroon, med and light pink come together for a fascinating cascade of color. The foundation chain is a multiple of 6 with an added 5 on the end. 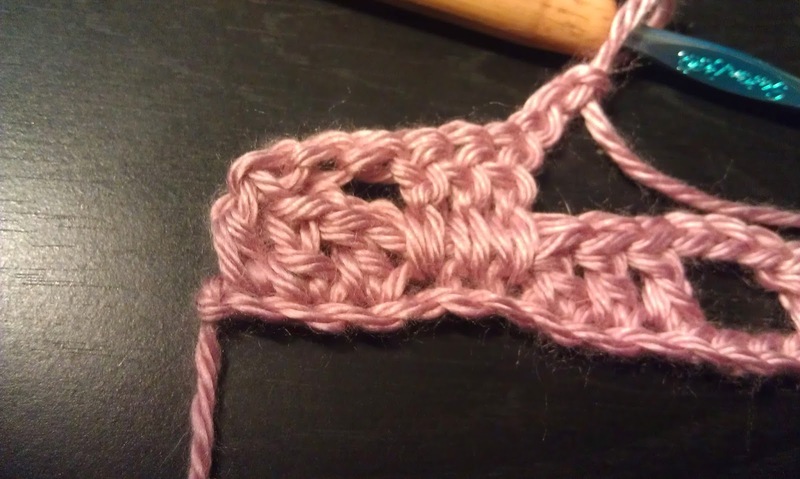 My pattern uses a base chain of 125. Next, you'll put 1 dc into the 4th ch from the hook to get started, and another dc in the next ch. Now ch 3. Then skip the next 3 ch and put 1 dc into each of the following 3 ch. Repeat from the ch 3 to the end of the row. For row 2, we're gonna keep with this color turn and ch 3. We're gonna skip the 3 dc in the previous row, then working over the ch 3 space, we're gonna put a dc into each of the 3 skipped ch in the foundation ch. Note: For this starting point, you'll be using one loop from the starting ch. Then ch 3 and again skip the next 3 dc and working over the previous ch 3 space, put 1 dc into each of the skipped ch below. Notice how you are working those dc around the ch 3? Repeat this process to the end of the row. Now for continuing the pattern, when you move on to subsequent rows, you'll still be working around the ch 3 space, but you'll be placing the dc into the 3 dc from the rows below using both loops. I hope the above mini-tutorial helps you understand the light complex piece to this pattern. Below, you will find the entire pattern and photos to ogle! 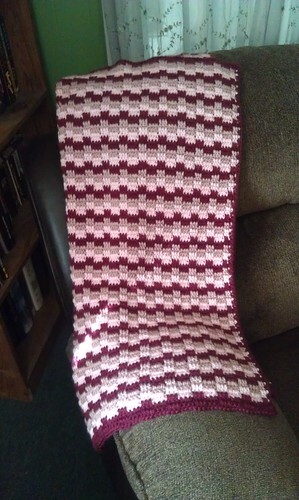 Repeat rows 2 and 3, alternating, until blanket is desired length. Border: To make the final row similar to the beginning row, put dc into the skipped dc 2 rows below, same as the pattern repeat, however, instead of chaining 3, you'll be putting a sc into each of the dc in the previous row. Then, sc evenly all the way around to finish. 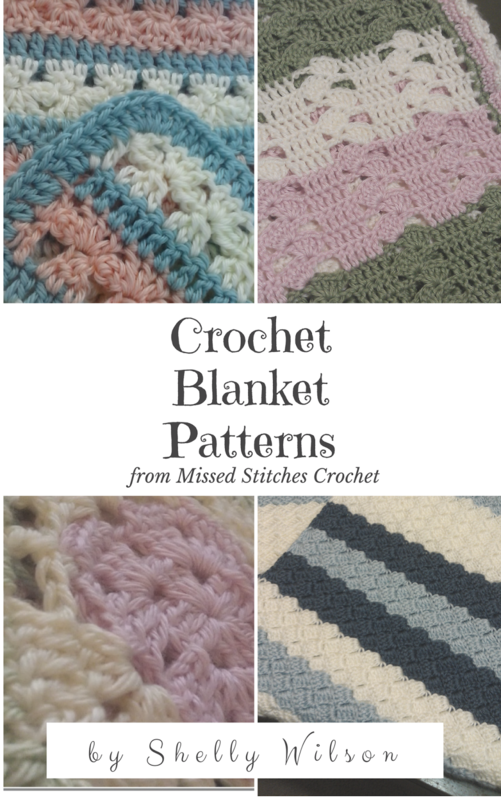 Help Keep The Free Patterns Coming! Don't want to donate but want all the patterns in one convenient place? Pick up my eBook on Etsy! I knew I forgot something, and for the life of me couldn't figure out what. Judy! You found it for me! The finished size of mine is 32" x 36" but you can just keep on going if you got the yarn! Thanks for catching that for me! I'm not sure where in the pattern you are to change colors... I want to use the three colors as pictured, but at the end of what rows do you switch? I am new to this type of pattern. How do I figure out my chain for a larger blanket? 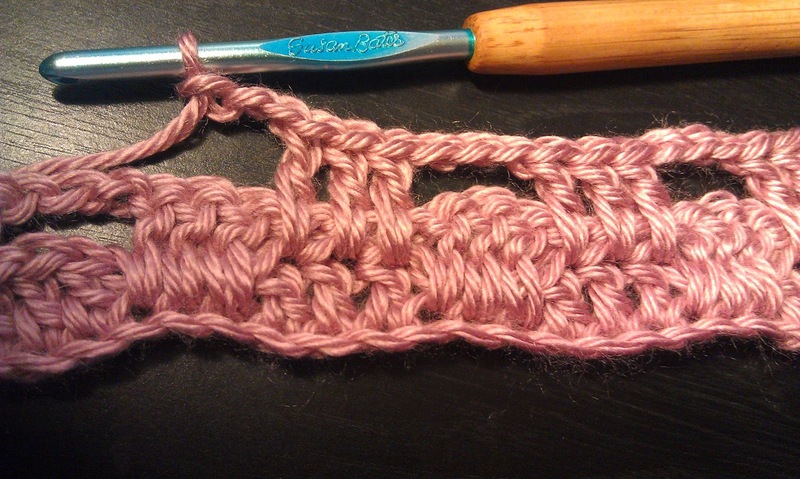 This alternating block stitch as a multiple of 6, plus 5 for base chain. Sorry for the late response and I hope this helps!